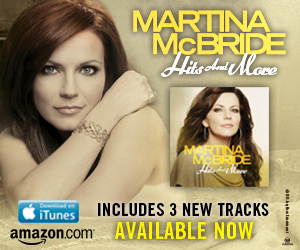 Martina McBride’s new album “Hits and More” is out now and we have some copies to give away! The album includes all her memorable smash hits plus three new songs. Martina is known for her amazing voice and powerful lyrics. To enter our give away, simply send us your favorite Martina lyric with your contact information. We will select three winners at random to enjoy this delish album of hits! The deadline to enter is January 27, 2012. Enter now to win this spectacular CD!